This circular swirls design pendant set is encrusted with a cluster of 170 sparkling diamonds, fashioned in a mix of yellow & white gold that accentuate it more. The four piece set features removable pendant that hangs on a slim cable chain that secures with a lobster clasp. The matching stud earrings secure with a 1.3 mm post screw back closure. This is the perfect gift for the holidays that complements women's everyday looks. 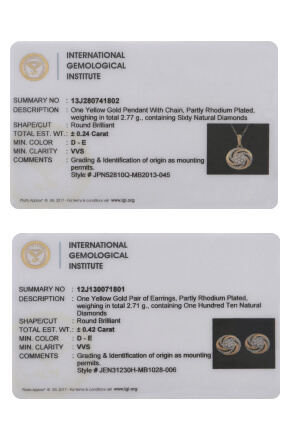 IGI Certificate available with purchase. Lifetime guarantee included.